This is the first in a series of 3 articles about High Speed rail in the UK. Since the publication of the government´s policy document in January 2012 entitled "Review of the Government´s Strategy for a National High Speed Rail Network" I thought it time to review the situation and publish this blogger´s thoughts on the matter. I was on the point of publishing the first article when the government came out with its latest proposals concerning phase 2 of the project - the extensions of HS2 from Birmingham to Manchester and Leeds. These were published 28th January 2013 under the title "HS2 phase two initial preferred route plan and profile maps"
The first of the three articles dealt with, specifically, HS2 so needs to be updated to take into consideration the latest information. It will, therefore, be published second. Thus this article, still valid, is published first. This blogger works under some assumptions. -Any new transport construction should be developed so as to make the most efficient use of energy, and reduce the toxic and noise pollution from the most offending vehicles,thus leading to their reduction in use and the liberation of space on public ways. -The existing rail corridors should be recognised as such, and therefore, accepted as being the main arteries of the country. They should all consist of four tracks of rail (next to or near each other) so that there can be a separation of fast rail from regional, local and freight services but interconnecting in case of need (for emergencies or maintenance). -projects which become self serving to the interests of political, financial, technical and legal groups to the detriment of the public good. When many people, particularly politicians, talk about High Speed Rail they refer to connecting the far reaches of the kingdom to the capital thus reducing travel times, adding wealth to the economy and reducing the need to use other forms of transport which are more polluting. With fast travel times, for freight as well as passengers, then the advantages of using the trunk roads and motorways with private transport is much reduced. If prices are reasonable then the attraction of using fast rail transport increases substantially. This has been proven on every rail line where the speeds were increased. We encounter troubles when we try to marry these desires of greater speeds to the benefit of the greater number. The benefits of obtaining lower travel times between cities has already been shown to be a long term project. The proposed HS2 programme from London to Birmingham will not come to fruition until 2026, thirteen years hence, if and when it becomes operational as envisaged. The second phase from Birmingham to Manchester and to Leeds would not be open to the public until 2033 as published by HS2 Ltd., the government agency charged with planning and building the project. All this assumes that there are no delays to which public construction projects are prone. What this blogger proposes is to attack the problem of long travel times over the trunk routes to Scotland where the problems of line speed and curves are greater. Add to this that great extensions of new lines together with updating of classic lines will have to be done at some time. If the promises made to run the lines up to the two main Scottish cities are to mean anything, on projects which will take a long time to implement, then do them now, or they will never be done. To achieve substantial increases in speed and lower travel times the following can be done on both the WCML and the ECML. The results are explained below in the areas to be developed and the route kilometres reduced. Running on the classic line to a point 4.23 kms. out of Glasgow Central station and then on a new 2 track line to complement the present WCML. (UR) 2 to 4 track 15.6 kms. According to the present timetable the fastest trains from London to Lancaster take 2hr 25 mins. (with three intermediate stops) while the next fastest taking up to 2hr 30mins. (with three stops). The trains from London Euston to Glasgow are timed between 4hrs. 30mins. and 4hrs.48mins depending on the number of stops (six to seven). It is, therefore, logical to assume that on new and improved lines the distance being from Lancaster to Glasgow about 235 kms. (147 miles) then the running time can be, at a very conservative estimate, one hour or less including stops. With the improvements from Lancaster northwards added to the improvements which can be made southwards then we can be looking at a running time from Euston to Glasgow in the region of 3hrs. 30 mins. or less - which is what the original objective was - very competitive with the airlines.. Updated route (UR) to 4 track 7.33 kms. a completely new line going as close to the Northumberland National Park as permits reducing the distance over the route substantially. and opening up the Borders for regional rail transport. (NR) 143.0 kms. an underground connection under the Tyne to miss out the complex rail pattern in Newcastle City Centre. Obviously trains originating in Newcastle would leave from the City Centre station. (NR) 11.5 kms. (UR) from 2 to 4 track 2.9 kms. (UR) from 2 to 4 track 11.6 kms. 2 track new (NR) 6.5 kms. (UR) from 2 to 4 track 4.8 kms. via Durham (CR) 14.7 kms. 2 track new (CR) 13.7 kms. (NR) 11.2 kms. (UR) from 2 to 4 track 5.35 kms. other unmodified track 7.65 kms. According to the present timetable the fastest trains from London to Darlington take 2hr 20 mins (with one stop) while the next fastest take 2hr 35 mins. (with four/ five intermediate stops). The trains from London Kings Cross to Edinburgh are timed between 4hrs 22mins. and 4hrs.44mins depending on the number of stops (four to eight). It is, therefore, logical to assume that on new and improved lines the distance being from Darlington to Edinburgh about 220 kms. (137 miles) then the running time can be, at a very conservative estimate, one hour or less including stops. With the improvements from Darlington northwards added to the improvements which can be made southwards then we can be looking at a running time from Kings Cross to Edinburgh of under 3hrs.30mins. - which is what the original objective was- very competitive with the airlines. From the map above you can see that the major works necessary are from Lancaster and Darlington northwards. That does not subtract from the fact that probably the biggest bottleneck on the ECML is the two track path through Welywyn Garden City which must be increased to four track (at least) as soon as possible. The ECML needs to be four tracked(at least) from Darlington southwards along its whole length with some line straightening. -Darlington to Northallerton - 22.0kms. -North of York (Skelton) 0.6kms. 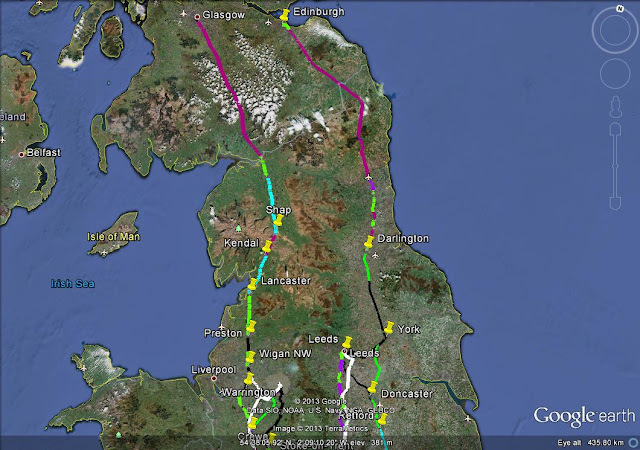 -South of York to Doncaster 42.6kms. 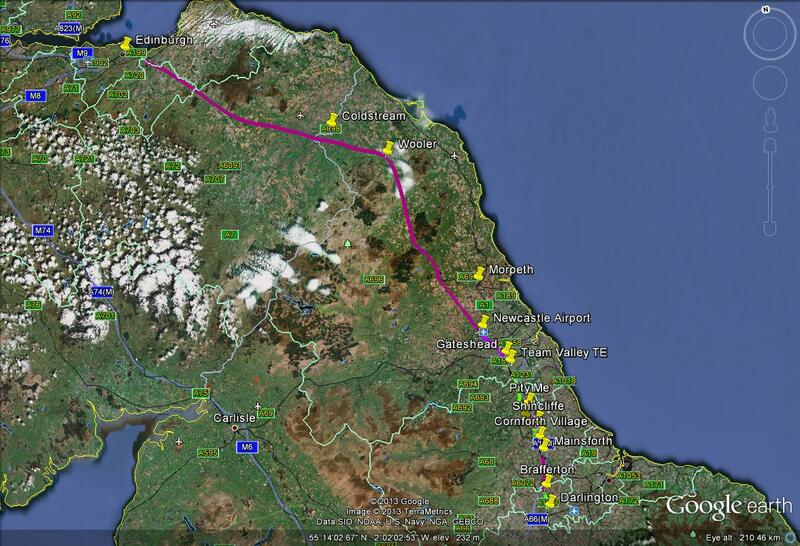 -Doncaster to Retford in three sections totalling 22.85kms. -upgrade and straightening south of Retford 18.8kms. -North and south of Newark 32.0kms. -plus the necessary upgrade to 4 or more tracks at Welwyn garden City 4.5kms. The only part of the upgrades which is urgent is the 4 tracking of the line through Welwyn Garden City. However, these works, done over the mid term, would ensure the line capacity for the future enabling the separation of intercity passenger traffic from regional and freight traffic. The WCML encounters other problems south of Lancaster. Four tracking to Crewe. 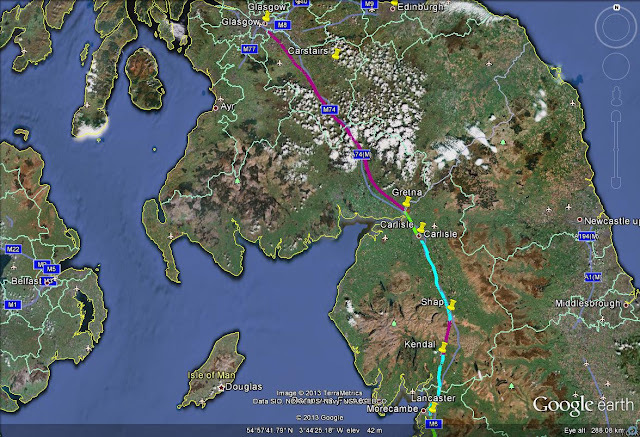 -Lancaster to Preston 32.3 kms. -Euxton South to Wigan NW 12.4 kms. -Lowton to Winwick 4.6 kms. -M/C Ship Canal to Acton Bridge 13.0 kms. -Weaverham to Winsford 9.25 kms. These works are a must which cannot be left off the agenda for a long time. Though they are not yet urgent they will be after the newly electrified lines northwards from Liverpool and Manchester to the WCML become operational coupled with the natural growth in inter-city, regional and freight traffic. The busy junction at Crewe itself with many lines crossing on the flat makes for reduced operations. Here a north-south underpass (of only 4.5kms) would facilitate speed for non-stop trains through the junction. or, my preference (because of intrusive viaducts and noise pollution) (c)it would best benefit from the same north-south underpass. Stafford would also benefit from an underpass (4kms.) to reduce the curvature of the line for non-stop trains through the town. This would increase line speeds and ensure the town does not suffer major works. Add to this two short sections (totalling about 8kms.) north of the town together with a section to be fourtracked and straightened (6.23 kms.) to the south and line speeds can be maintained at high levels for through traffic. The Trent Valley section has to be fourtracked all of its length as there is still some (12kms.) (south of Nuneaton) which is only three track. The section from Rugby to where the Northampton branch(south of the town) rejoins the WCML (at Roade) needs to be fourtracked from two (34 kms.). This would alleviate the usage of this section by freight and regional trains as well as the inter-city fast ones. These works from Crewe southwards would total 68.73 kms. These developments would satisfy much of the present traffic forecasts without any other construction for a mid-term period but on their own they are not the long term solution. That only comes with these together with the other developments on other lines to satisfy demands for the rest of the century. However, these measures can be taken both on the ECML and the WCML in the next twenty years. The conclusion reached is that so much can be achieved by looking northwards to Scotland. The desired line speed increases can be obtained by looking at the less developed part of the rail network, in the more difficult terrain. Of course, it is going to be expensive to build but these developments can be achieved in a relatively short period and are for the long term. 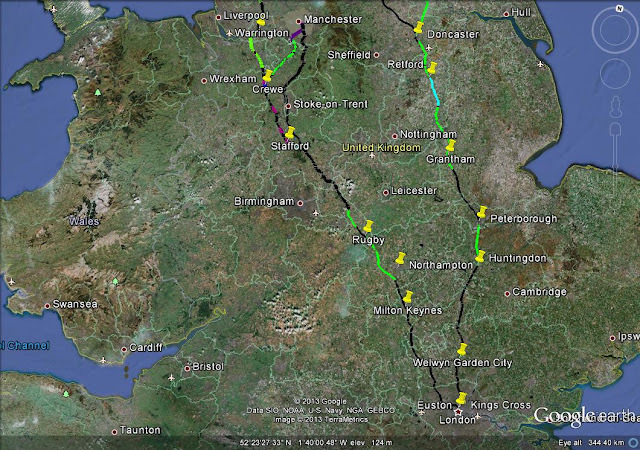 If the bean counters had had their way in the 1830s-40s then neither the ECML nor the WCML would have reached Scotland. Let us not fall in that trap of being under the bean counters.. These upgrades and (relatively) minor new works are far less disruptive than driving straight lines through housing, businesses and beautiful countryside and which will only provide stops two or three times(at most) on the journey. We do not want point to point passengers from London to Glasgow/Edinburgh only. We want more passengers travelling between stations along the route to where they want to go. Minors and pensioners tend not to be drivers so find out of town Parkway stations a hindrance more than benefit. It is no problem to use the classic lines to enter the city centres where the vast majority of the people want to go or catch public transport for onward travel. Emphasising this means that the customers (which are to be SERVED - let us not forget that) get what they want, where they want it and will help reduce the number of cars on the roads. This way a greater number of potential passengers is catered for, over a wider area, at a lower cost both financially as well as environmentally. I emphasise that by focusing this way the much yearned for connections from Scotland to England will get built and that blessed country will not be left out on a limb as has been so frequently in the past.